You've upgraded to OS X Leopard, played with Time Machine, tweaked things to your heart's content and now you want to play with something else cool you've heard has made it's way into OS X - ZFS. Unfortunately, Apple have only bundled read-only support for ZFS to date, but we'll be changing that. WARNING: ZFS read-write support is still very experimental and if you're not careful, it WILL crash your Mac. Right, now we've got the warning out of the way, lets get cracking. First, you need to get hold of the ZFS Beta Seed pkg from the ADC. If you don't have an ADC login, you can register for free. Due to an unfortunate bug in the packaging, you won't be able to install the ZFS Beta Seed pkg by simply double clicking the pkg if you're running 10.5.1. This bug doesn't affect 10.5. Now we've got read-write ZFS support installed, we can create our first ZFS filesystem. In this example, I'm going to use a USB memory stick, but you can use any free partition, or even files (drop me a line if you want to know how to do this with files). Ensure the device(s) you are going to use are connected and powered on. If these devices already have filesystems like FAT or HFS+, OS X will mount them automatically. Unmount, but don't eject them by opening up Disk Utility, select the device and click the "Unmount" button. ... where is any name you want and disk#s# is the "Disk Identifier" you noted above. In my examples I use "myzfs" and "disk2s1" respectively. This is the zpool we've just created. It will have a ZFS filesystem on it too. You can find more about what you can do with ZFS in my ZFS Cheatsheet, just note it's based on the functionality available in OpenSolaris. OS X may not have all this functionality yet. Now for the important part: right at the beginning, I said ZFS WILL crash your Mac. I wasn't joking. 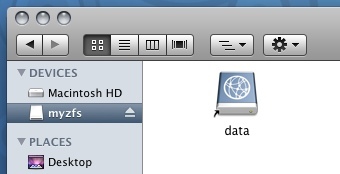 Just remove the device you have been using, try access it in Finder and see what I mean. 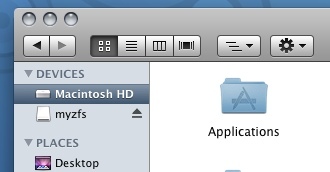 Don't just eject the the filesystem from Finder as this doesn't change the ZFS metadata for the device (yet). You'll now have your ZFS filesystems as you left them. Now at this point you may be wondering what the fuss is all about, you can do this with HFS+ or FAT anyway. I agree you can, but the true power of ZFS comes to life when you have lots of disks, or you want to setup some sort of redundancy using RAID. This is very easy with ZFS and you'll be safe in the knowledge that your data is safe.